Just as the summer drew to a close, my summer knitting project was finally finished. It’s a heavily modified version of the Clearwing pattern that I have used before, this time with linen yarn, short-sleeved and without the pattern at the neckline. It was a bit of an epic knit; knitted on small needles (2.25mm) it took two summers (although I was knitting it on and off in between other projects, and it was hibernating for many months at a time). I am fully aware it is exactly the kind of knitting a lot of knitters find incredibly tedious. A large-ish project of endless rounds of stockinette stitch, no challenging patterning to provide mental challenge, no colour changes to look forward to, and, perhaps worst of all, in a yarn colour that could be described, in the absence of a better word, as beige. It is the natural linen colour, undyed and unbleached, and being as I always am fond of the natural muted colours that nature provides, I quite like it. It is fascinating to me how the colour changes with different light, mostly it looks more pale grey than beige, although in some lights the beige-ness of it definitely comes out. So the beigeness of the yarn did not bore me to tears, and neither did the monotony of knitting endless rounds of stockinette stitch. In fact I find this kind of knitting very meditative and soothing, it’s Zen knitting that suits me just perfectly. I always need at least one knitting project on the go that is just simple knitting, no thinking required, just going round and round, giving my mind a chance to either rest, wander off to wherever it wants to go or else give you a chance to chat to someone or watch some telly. 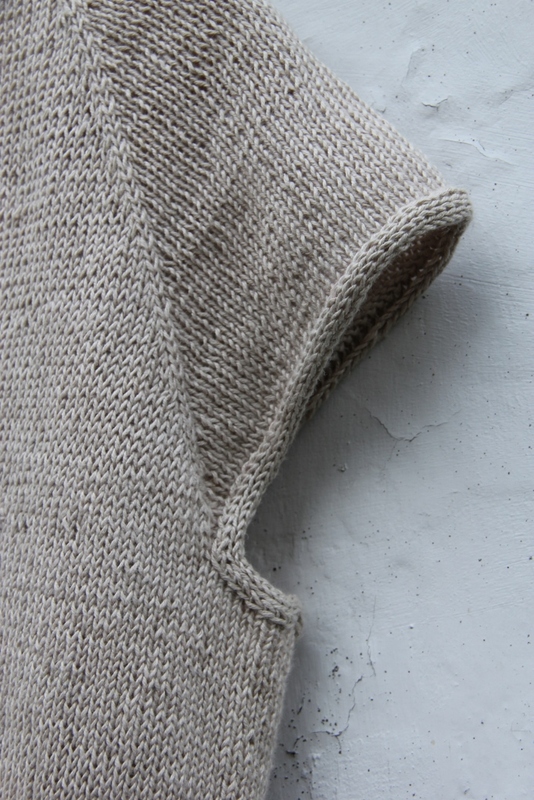 The yarn is organic linen, beautifully and somehow very appropriately named Sparrow by Quince & Co. When I bought it, it didn’t come in any others colours, although these days there are several beautiful colours to choose from. It’s a beautiful yarn, not harsh like some linen yarns can be initially (although they do all soften with use). 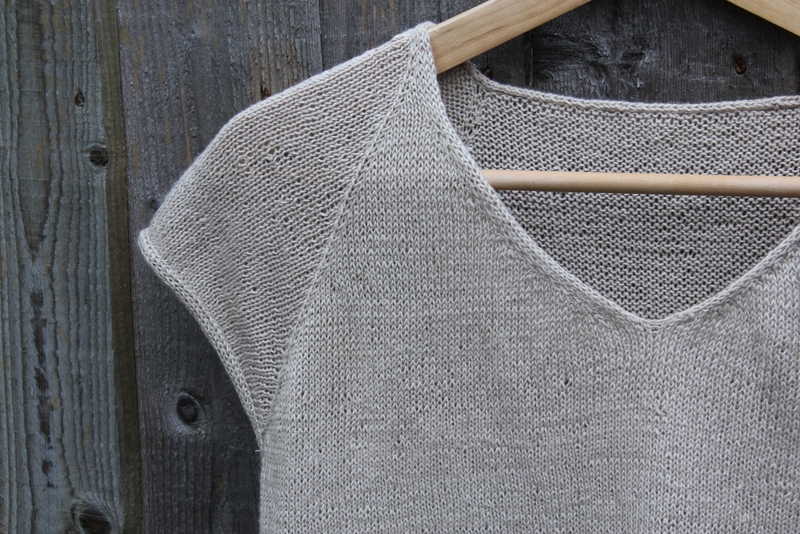 Being a plant-based cellulose yarn, it is of course not stretchy at all, and in the beginning I found it quite hard work to knit – compared to soft wool with its natural stretch knitting linen feels like it takes more effort, especially to keep the tension even and not too loose. After a while, I did get used to it though, but you can see the gauge changing – in the beginning, at the top, it was much looser and more uneven, and towards the end it was much neater and smaller. Cotton, although hard to avoid in clothing these days, is not always a very sustainable choice as it requires a lot of water and pesticides to grow. For this reason I quite like the idea of using linen for my summer knitting. And from a quality point of view, I would be very happy to use this yarn again, it just feels smooth and crisp, already you can feel the softness that is going to come out with wear and washing. But from a sustainability point of view, there’s one big but: Quince & Co Co, based in the US, use Belgian linen so by the time they have spun the yarn and shipped it to me here in the UK, the yarn has crossed the Atlantic twice, which makes quite a few yarn miles. I think for future linen projects I’d like to try to find a European supplier, if I can just find a yarn that matches the quality of this one. I sometimes think I’d love to grow my own linen, and then spin it, but having done a bit of research on it, it just sounds like a lot of very hard work (as well as some extra equipment to break the plant stems) so it is definitely a project that needs to wait for a year when my energy stores are fully stocked up. Meanwhile, it is now time for big woolly jumpers so I am on the lookout for new chunky jumper patterns and yarns and this little T-shirt will sadly have to be tucked away in the cupboard to wait for next summer. 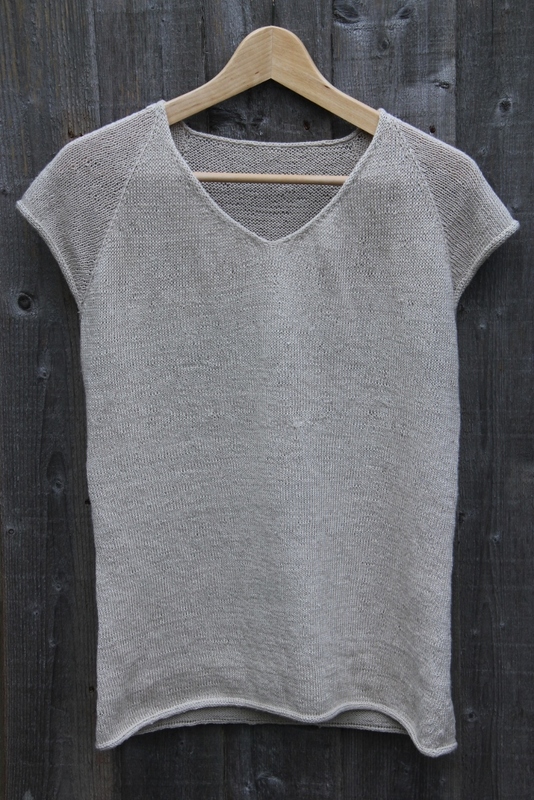 Categories: Jumpers, Knitting, Sustainable Crafts | Tags: Clearwing knitting pattern, knitted T-shirt, knitting with linen, organic linen yarn, Sparrow yarn by Quince & Co | Permalink.